Wetlands and reed beds form an important element of our natural environment and they are so much more than just a means to capture and store storm water. Their importance as a habitat to support a wide range of wildlife, their use as a social amenity and their aesthetic value are now also widely appreciated and valued. Reed cutting is part of the essential maintenance of these valuable habitats. Without management, natural succession would mean that the reed beds would eventually dry out, becoming scrubland and woodland. The optimal time for reed cutting to ensure its dominance is from November through to March, as long as the water levels are appropriate. Summer cutting can be carried out, though this will reduce the competitive ability of the reed and encourage a more diverse mix of vegetation. In order to have minimal impact on these natural habitats, when the project is too large to be carried out by hand, a lightweight, amphibious machine is the ideal tool for the job. The Truxor is extremely lightweight (it is towed by a 4×4 vehicle) manoeuvrable, and can work on land as well as on the water. This makes it the perfect machine to work in sensitive or difficult to access areas. 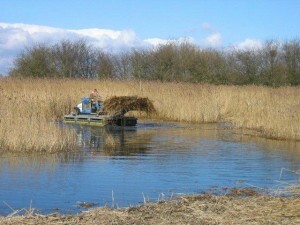 The Truxor can be used to cut, rake and remove reeds as part of a general reed bed maintenance programme, or to enhance a reed bed for wildlife – for example to cut areas into the reed bed to enable easier feeding for nesting birds, such as Bittern. With over 20 years experience the AS team have worked with the RSBP, and on Sites of Specific Scientific Interest, using the Truxor to great effect to manage reed beds and maintain these important habitats. Take a look at how we created a food flow for Bitterns nesting in a Norfolk reed bed here.